Internships offer students a glimpse of practical experience in the logistics industry. Lack of practical knowledge makes student vulnerable to market’s extreme conditions.Industrial Internships programs are valuable to students as it allows them to experience how their studies are applied in the “real world”, and also this work experience can be highly attractive to potential employers on a candidate’s CV. With the objective of making our students professionally sound, we offer compulsory internship program that helps students to get a live experience with the current industry practices. With years of experience in logistics and supply chain field, we have also been developing and distributing ERP with in-built logistics and supply chain functionalities for companies in India and Gulf region for a long time. With practical exposure provided by companies during the internships, familiarizes them with live environment and as a result well performing students are picked up by the companies for placements. 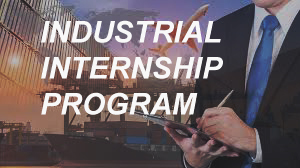 Industrial internship program becomes an integral part of the course curriculum which helps students to go outside the academic level to enable themselves with the various industrial practices, which will in turn groom them as a better logistics professional which is in high demand for the industry.